Few days ago, I enthusiastically brought some Madras onions. I love this little gem in just about everything-stews, stoups, soups and roasted. How about pickled ? OO Perfect! I love all the spicy, tangy and oily Indian pickles and I have atleast 3 store bought and 3 homemade pickles in the fridge. We enjoy them every now and then... okay almost everyday. So I wanted to treat this babies differently. Indian of course but just not the traditional ones. So I put on my google dress and started looking up and down. Surprisingly I didn't find anything inspirational. I patiently closed my laptop and went along preparing the food for dinner. A day or two passed and nothing happened to the babies. And then it was time. All this while I was pondering over what to do with you, I haven't forgotten you and finally I have come to you with the perfect solution. You will still be beautiful, gloriously purple with little black specks and red fires. Oh and crunchy, just like you are meant to be. And I can kiss how much ever I have you. * Every red chilly packaged locally here is called red dry chillies. Does it have a name people! I don't know. So here I took a picture. But any red chilly would do. I have a collection of at least 5 types of dried red chillies. Pickling the onions is one thing but peeling all that onions? Before you answer that this is what I did- Fill a pot with enough water to drown all the onions and bring it to a boil. Once it comes to a vigorous boil drop the babies and let it boil away for 2-3 minutes. Drain and place it back in icy cold water or just drop few cubes of ice on top like I did. Now you don't have to get a cutting board or a knife. Just pinch the onions on the right place and they shall be out of there dress skin. Let them cool. Once cooled pour cold water to drown the onions and put the salt. Leave overnight. The next morning, or evening (as my case was), drain the onions again. In a sterilized jar goes the red chillies, nigella seeds, sugar and garlic. Then push down the onions. And fill the jar with vinegar till most of it is drowned. Leave for 2-3 days. Vinegary, crunchy, just spicy, sweet and salty. This is everything you want a pickled onion to be. A great addition to any meal. 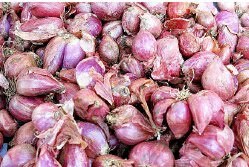 Update: Thanks to PranisKitchen for putting up that question on if Madras onions are pearl onions! To be honest I knew that question will pop up and but I got to lazy writing about it. You gave be the drive! Okay so there is alot of misunderstanding on what exactly a madras onion is. Some call it shallots and some call it pearl onions. I mostly call it baby red onions. You may debate that shallots are actually much milder than onions and sweeter. Yes thats true! This ones are the "real shallots" . Onion plant normally forms a single bulb whereas baby onions I refer here forms clusters of offsets like the garlic. These are also reffered to as "Shallots" even though they taste different from the what the french consider " the real shallot". So yeah you can call them shallots. what a lovely color..the onion pickle is so yummy..feel to pick one or two from the photo..lovely presentation..
madras onions are the pearl onions or different? Wow!! looking great like padhu i too tried this with out nigella seeds. Thank you :)I hope my answer in "update" helps! Thank you! Nigella Seeds gives it an extra layer of flavoring, subtle yet pleasing. I love the color! Sounds like a simple thing to put together, as well! how strong the vinegar is?